At the Willennar Genealogy Center in Auburn, Indiana, they just set up a display of 4 documents about the foundations of our government. They’re on loan from The Remnant Trust based in Texas. A lot of the credit goes to Caleb who has a History Degree and is incredibly excited about the opportunity. One document is a copy of the Magna Carta from approximately 1350. The original Magna Carta was released in 1215. This illuminated manuscript also includes Statues of the Realm and Register of Writs. It influenced the American Bill of Rights and Constitution. A second is a copy of the proceedings of the Pennsylvania General assembly dated 1777 that includes a copy of the Declaration of Independence as well as negotiations with Chiefs of the Six Nations. The third is a first edition of the first official printing of the U.S. Constitution after Connecticut (the 5th state) ratified it in on Jan. 9, 1988. It was printed before the Constitution became effective March 4, 1789. Last is the Journal of the First Session of the United States Senate Held in New York City March 4, 1789. It includes seventeen amendments to the constitution proposed by the House of Representatives that were rejected and 12 passed by the Senate of which 2 were not ratified by the states and the rest became the Bill of Rights. The Senate journal also contains the first address of President Washington to Congress, the first rules of the Senate and other legislative works. It also contains the tally of the votes for each of the candidates for President itemized by state. Ordered, That said Declaration of Independence be put on the Minutes of this House ; and that the same be entered among the Records of the State, when an office for such purposes shall be established. The declaration text is listed including all of the signatories organized by state. Then is the text “In CONGRESS, January 18, 1777. The documents will be on display until the end of July so they arrived just in time for July 4. I had to take down my dome yesterday. It had been collapsing more and more the past few weeks. Finally, I had to take it apart because it was getting dangerous to the neighbors. 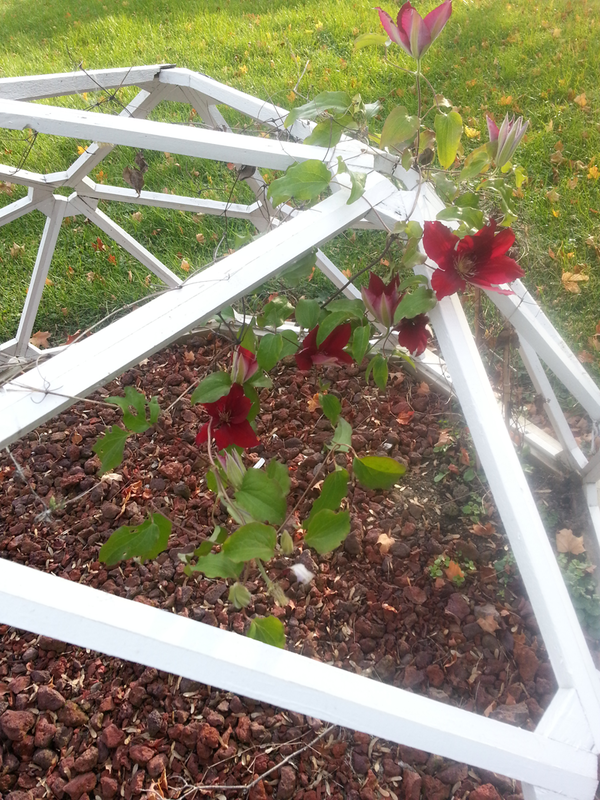 Here’s an old picture with a crimson clematis. I have used it as a trellis for several years. This year, one clematis was covered with dozens of huge blossoms. After a large rainstorm, the weight was too much and the dome started collapsing. Although domes are aesthetic, they can have a problem: if one part fails, the rest has stress that leads to progressively more severe destruction. It was only a matter of time until the dome collapsed. I wanted to ignore the warning signs and now I have a pile of broken wood behind my house. I didn’t ever plan to take it apart. Now I’ve got to make sure my tetanus vaccination is up-to-date. The wood has dozens of nails that can’t be removed. I’ll have plenty of opportunities to get cut as I break it down. Although I titled this “Down,” that is only in contrast with the movie “Up” written by Pete Docter, Bob Peterson and Tom McCarthy. I’m leery of watching Disney movies. The studio is quite heavy-handed with movie scores. The studio uses the music to push the audience to feel the best mood for a lucrative box office. “Up” had a scene with the characters Carl Fredericksen and Russell talking about Russell’s dad and ice cream. It was very emotional, but in a subtle and poignant way. It immediately struck me how, in those scenes, my feelings were genuinely tender. There was no orchestral music swelling in the background. No one demanded that I have the correct feeling. Just the situation, dialog and facial expressions carried the mood. I think this is a sign of excellence by the directors Pete Docter and Bob Peterson and the team that put the movie together. I could be really sad about the dome being gone. After all, it was really a source of pride. However, I don’t have any Hollywood “true story” tragedy music playing in the background. I can feel whatever I choose and I choose to be glad that I had it while I did. I’m binding my poetry into books. I’ve got two books so far of 300 poems. My books of the next 300 will be done soon. I’m working all day tomorrow, so it’ll have to wait until I get home. I love my velobind machine. I had forgotten that back in 2011, when I would write a poem, I might write a one page meditation about the poem. Reading them again is like meeting myself a second time. Some feelings are the same, some are less familiar. All of the shouting about climate change misses the point. We’re hurting our planet. The exact mechanism doesn’t really matter. Animals are suffering. Plants are suffering. The oceans are suffering. The land is suffering. The air is suffering. People are suffering. The planet is suffering and we’re to blame. The first phase of a great war has begun: Scorched earth. The jungle has been filled with unfriendly foes. Our allies started the first round. Everything in sight near the base’s borders has been killed. The round up of the enemies has taken its awful toll on the jungle closest to the base. No one has returned (yet). It’s a race between the foes and friends to see who will seed combatants first. I may have to invest in some mercenary reinforcements and plant interlopers where death is currently holding our vain hope. A second front of the scorched earth campaign took down vines covering the foliage unchallenged. They had been hiding horrific mines planted with the help of enemy canine patrols. They were attacked with two or three salvos. Nothing but remnants have been left behind. The second phase of the war has already started: Decimation. A friend of mine accused me of being old school today. Lately I’ve been sending friends U.S. Mail letters. I think that getting a piece of paper in the mail is appreciated a little more than a missive in e-mail. It’s got some substance that you can decide to save in a scrap book when it comes from someone special. I treasure the letters I got from my grandmother. When you read the letter, you’re seeing more than merely the traces of my fingers on a keyboard tidied up by a spell checker. You can see that there is a real human that you are communicating with. What’s more romantic? Getting an email from your date thanking you for a nice evening or a physical card expressing gratitude in a flowing cursive script? I’m not real enamored with “internet time.” The passage of time gives some perspective. I’m less likely to go on a circuitous rant about the current political dispute if I take 10 minutes writing in ink. I’m not going to hit “send” with some half-baked whining that I’ll regret 10 seconds later. Time has great power. I don’t take enough of it. When I write a letter, you know that it’s something from the heart. In the book “Alone Together: Why We Expect More from Technology and Less from Each Other,” Sherry Turkle said “With some exceptions, when we make ourselves vulnerable we expect to be nurtured.” (p. 235) She’s referring Erik Erikson and the expectations coming from basic trust. That’s something that’s completely counter to the way that the Internet often works. For the most part, any time you put yourself out there, you’re at risk of being attacked or ridiculed rather than built up and comforted. One place for this risk comes from places that encourage intimacy. It’s not always easy to trust people to begin with. Letting your guard down out there in the social media dystopia isn’t always safe. 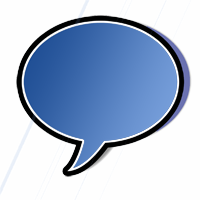 If one makes comments that might be too hard to share in person, it can still end up hurting. One reason for this is that anonymity allows people to be more negative and exhibit the dark tetrad personality traits when, in person, they wouldn’t act out. To them, the idea that people have feelings or that they are afraid of being humiliated is alien. Often, the enemy only feels good by getting some lolz. Sometimes you can find a community of like-minded people where you can be safe. This reflects Sherry’s comment “Communities are places where one feels safe enough to take the good and the bad.” (p. 238) I’ve found some, like deviantART, are different than most social media. One reason is that to belong there, you have to put in some work. You can’t just repost an inane meme and belong. A member of dA is a creator. A pretender just looks around and is lurking. Every time you get in front of a computer screen and post something on Twitter or Facebook, it’s possible to misstep and be misunderstood catastrophically.